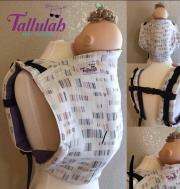 Tallulah Baby Designs is offering 2 very special buckle onbuhimos, 110th at Daybreak. 110th is Emmeline Textiles' newest pattern to be released. The Daybreak colorway is super exclusive as it was only released as scrap and will not be release in wrap lengths. There will be 2 ways to purchase a 110th at Daybreak onbuhimo. The first way is through this Thursday's stocking. 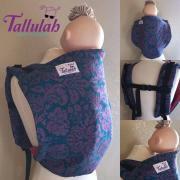 We will stock 1 ready-to-ship half toddler conversion on Thusday, August 24, 2017 at 9am PST. The second way will be through a right-to-buy draw for a semi custom onbuhimo. The draw will close August 25, 2017 at 4pm PST and is open to all except residents of Canada.